On April 24, 2018, the U.S. Environmental Protection Agency (EPA) announced that it would be presenting a webinar to assist processors with reporting under the Toxic Substances Control Act (TSCA) Inventory Notification (Active-Inactive) Rule, published in the Federal Register on August 11, 2017. This webinar, scheduled for May 23, 2018, from 1:00 p.m. to 4:00 p.m. (EDT) will “include an overview of reporting requirements for processors, a demonstration of the electronic reporting application (Central Data Exchange, or CDX), and will provide time for questions and answers.” Registration for the webinar is not required. The webinar will be available through the following link on May 23: http://epawebconferencing.acms.com/tsca_inventory/. A link to access the TSCA Inventory is available here. The upcoming deadline for voluntary submission of a Notice of Activity Form A by processors is October 5, 2018. The PBT chemical on which you will speak. EPA has established public dockets for each of the chemicals to facilitate receipt of information on exposure and use that may be useful to EPA’s rulemaking effort. EPA requests that any information be submitted to the dockets by December 9, 2017, so that the information can inform any regulatory action. Under TSCA Section 6(h), EPA is required to take expedited regulatory action to address risks and exposures from certain PBT chemicals. 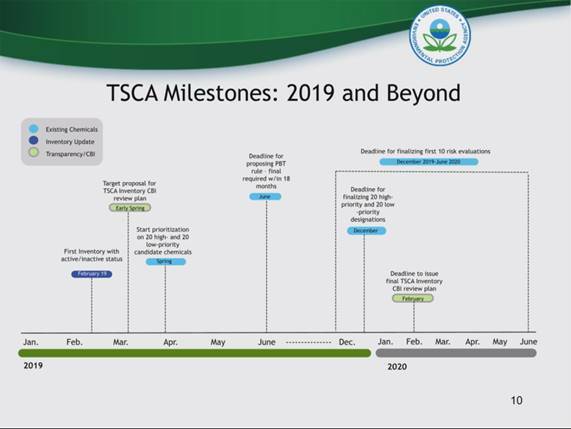 By June 22, 2019, EPA must propose rules for the above five PBT chemicals that have been identified under TSCA Section 6(h)(1). EPA is currently identifying where these chemicals are used and how people are exposed to them. Following EPA’s presentation, participants will have an opportunity to provide their comments on uses of these five chemicals.